Shapes and tones are wonderfully balanced. Love this photograph. 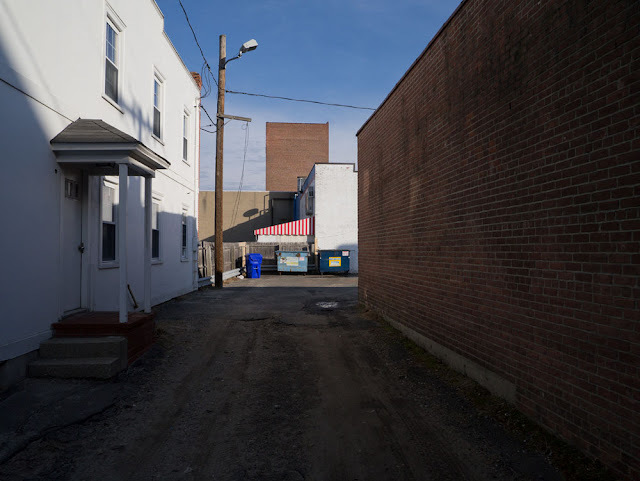 I know you have the title as 'Red Striped Awning', and that certainly draws one attention, but for me (the punctum for Barthes), the dumpsters add a 'heightened' sense of reality to the 'balanced' scene. By the way, how is the printing going on the winter light series? Easier than expected. Yesterday afternoon I picked half a dozen of them for printing. Several have an unusually short tonal range—no near-blacks or near-whites. This looks very faithful to the subjects on screen, but I wondered if it would be tricky to keep the print versions from literally "falling flat." But in fact for all of them the first print attempt looks really nice and may not need any further tweaking.